The trend of Americans retiring in foreign countries to live more comfortably opens a new frontier for advisors. “There’s no place like home.” Writer John Howard Payne coined that expression in his 1822 song “Home, Sweet Home.” Judy Garland memorably avowed the sentiment as Dorothy Gale in The Wizard of Oz (1939). Now, a growing number of American retirees are claiming the incomparable place they call home is not the United States but countries like Belize, Ecuador, Panama and Malaysia. Seeking sunny climes and an affordable cost of living, hundreds of thousands, if not millions, of retirees have relocated to such exotic locales to spend their golden years basking amid rainforests, caves and volcanoes, according to Kathleen Peddicord, publisher of a website Live and Invest Overseas. “It’s definitely a trend and expanding quickly now,” says Peddicord, who has covered the overseas retirement beat for 30 years and lives in Panama City, Panama. While there is no official figure on the number of people retiring outside the U.S., the Social Security Administration now sends benefits to approximately 500,000 foreign addresses and bank accounts. But that’s only part of the story, because many if not the majority of expats have their benefits direct-deposited to bank accounts in America. “Most people living overseas continue to manage their retirement income through a U.S. bank account,” says Peddicord, citing anecdotal evidence. One factor accelerating the pace of expat retirement and making it a more realistic option is the Internet, affording a super-easy way to keep in close touch with family and friends back in the States. Changing economics, however, is perhaps the underlying, main reason to retire overseas. Americans are unsure of Social Security’s future, and fewer are retiring with pensions and substantial equity in their homes. In short, retirement nest eggs aren’t what they had envisioned, so the plan of retiring to Scottsdale or Palm Beach is more-or-less kaput. In contrast, by moving to any of a number of foreign countries, folks get a comfortable retirement and even an adventure. The notion usually stems from budget panic, then blossoms into a fun idea. Whoa! Fantasy is one thing, reality’s another. Retiring to a foreign country shouldn’t be an impetuous act. Moreover, the process is complicated. There are three broad aspects to consider—financial, legal, accounting. And, of course, the availability and quality of health care is a paramount concern. Tax liability can be a big issue; likewise, the extent to which English is spoken in the new country. Easy access to the U.S. to visit grandkids and for major health care is a requisite for many retirees. Oh, and there’s the psychological angle: how well one deals with change and the facility to create new social connections. But, certainly, if a couple cannot realize their retirement dream of scooping up beachfront property in, say, tony Newport Beach, Calif., they may be able to afford it in Mexico or Panama. “They can have their place in the sun. They get to spend their remaining years in a home that looks out over the ocean. They’re close to the U.S. Retiring to another country can be an attractive alternative,” says Rich Hogan, managing director of investments at Merrill Lynch in San Francisco, who has several clients that have retired overseas. If clients already own a second home in the country to which they want to retire, that obviously makes the move easier: They know what they’re getting into. If not, Hogan recommends a test run. Rent a place for a few months or so—during the worst-weather season. Then decide: Like it or lump it. Once the big decision to relocate is made, key to making the process as painless as possible is to take care of most nitty-gritty prior to moving. Investment portfolios can be left in the U.S. and handled by the existing financial advisor, who’ll help coordinate the relocation process, then communicate with the client ongoing via email and/or Skype. “Everything is virtual now, so it’s not necessary in this day and age to have an advisor in the new country. It could be a want, but it’s definitely not a need,” says Cary Carbonaro, managing director of United Capital, based in Huntington, N.Y., and Orlando, Fla. Expat retirement is becoming a popular idea with her clients, she says. For a start, keeping the client’s existing advisor can minimize disruption. “This is someone that understands your goals and objectives. And you won’t have to sell all your assets and pay a bunch of taxes [by changing to a local advisor],” Hogan says. He paints this scenario to lock in reliable cash-flow: “You’ll probably be drawing down from your portfolio, so we’re going to change the allocation to ensure that money is there when you need it and set the amount to make sure it gets wired at the first of every month. We recommend having a banking relationship in the country of domicile as well as one in the U.S. so that funds can be wired and cash accessed locally, as needed. Failure is not an option when you’re living on a fixed income in a foreign country,” Hogan says. But here’s the other side of the existing-advisor vs. new-advisor debate: “It’s very difficult for [an FA] in America who has no expertise in dealing with international brokerage to help clients at the [high] level that he would want to,” says Douglas Goldstein, a former Dean Witter advisor in New York City who moved to Israel 20 years ago and is president of Profile Investment Services in Jerusalem. Calling Israel “the new Miami” because of its popularity with New York retirees, he recommends that folks contact him six months before relocating. “Then we can begin to move the accounts over,” says Goldstein, co-author of “Rich as A King: How the Wisdom of Chess Can Make You a Grandmaster of Investing” (to be published by Morgan James this spring). Another hot spot is Cuenca, Ecuador. Real estate is cheap. Peddicord says that a two-bedroom, two-bath apartment on the river—the best neighborhood—can be had for only $44,000. Other locales Peddicord is promoting this year as desirable for American retirees are Belize, Colombia, Mexico, Panama and Ireland. She notes that Costa Rica has “become expensive” but that other good choices include Croatia,India, Indonesia, Spain, Vietnam and France’s Languedoc region. It is notable that the majority of these choices are emerging Third World countries. For the adventuresome on a tight budget, Peddicord suggests Asia. “Right now, it’s more affordable than anywhere in Latin America—but it’s far away. Europe can make sense, but it’s not the cheapest option,” she says. Health care is of course a significant issue as people age; therefore, potential expats need to focus on it. Israel has an outstanding system for residents—essentially socialized medicine. But in Belize, for example, “serious injuries or illnesses often require evacuation to another country,” according to www.state.gov, a U.S. government website with country-by-country information on health care, safety and political and economic situations, among other matters. While Medicare is not accepted for people living overseas, retirees should keep their coverage—or start it—as an emergency back-up measure should they want or need to avail themselves of health care in the U.S., Peddicord recommends. Also, discontinuing Medicare and restarting it at a later date increases the monthly premium. In fact, taxation can be a real pitfall unless clients hire either a tax preparer who deeply understands the tax structures of both the U.S. and the foreign country or knowledgeable accountants in both countries who can be relied upon to communicate with each other. “We see all kinds of mistakes, typically with tax returns, and especially when people use one preparer that doesn’t know both sides,” notes Sally Taylor, director of financial planning at KeatsConnelly, a cross-border wealth management firm specializing in Canada-to-U.S and U.S.-to-Canada immigration. Further, Goldstein warns that many Americans are unaware of the Foreign Account Tax Compliance Act (FATCA)—which, when foreign institutions are in non-compliance, results in imposition of a 30% withholding tax on certain income, according to BlackRock—and the Report of Foreign Bank and Financial Accounts (FBAR). The IRS requires receipt of both forms. “You’ll be in big trouble if you don’t file an FBAR form. Fines start at $10,000,” Goldstein says. U.S. retirees typically will be subject to U.S. taxes unless they become citizens of the country to which they move. Carbonaro has clients with dual citizenship who pay taxes to both the IRS and the foreign country in which they dwell. However, they are required to pay no more than if they were liable for U.S. tax only, she says. Hedging against currency fluctuations. Set up a bank account in the foreign country and make regular transfers from the client’s U.S. account to cover daily expenses. 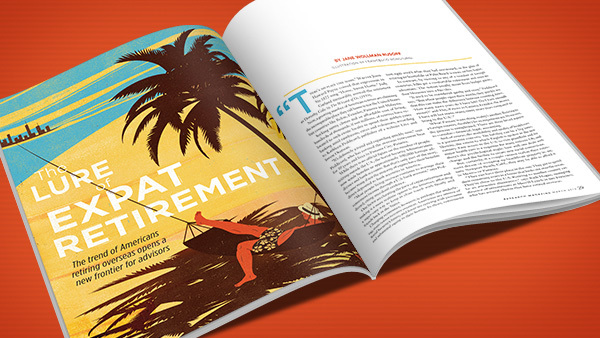 If American retirees work overseas and collect a foreign pension, they are subject to the U.S. Windfall Elimination Provision. This means that Social Security benefits will be reduced in proportion to their pension benefits, as is the case with pension-eligible retirees who live in America. Trusts established in the U.S. should be examined to be sure they’re enforceable in the new country and that cross-border bequests will be acceptable. Overall, before moving, clients and advisors need to figure out a long-term strategy and know the tactics to achieve it. “The devil is in the details,” Goldstein notes. True enough. But big-picture evaluation is critical indeed when opting for such an enormous life change.